Tonight we’re eating a very fresh meal. Dinner consisted of homemade pasta stuffed with sauteed crimini mushrooms, blanched spinach, herbed goat cheese, and toasted almonds served on a bed of freshly made basil pesto. 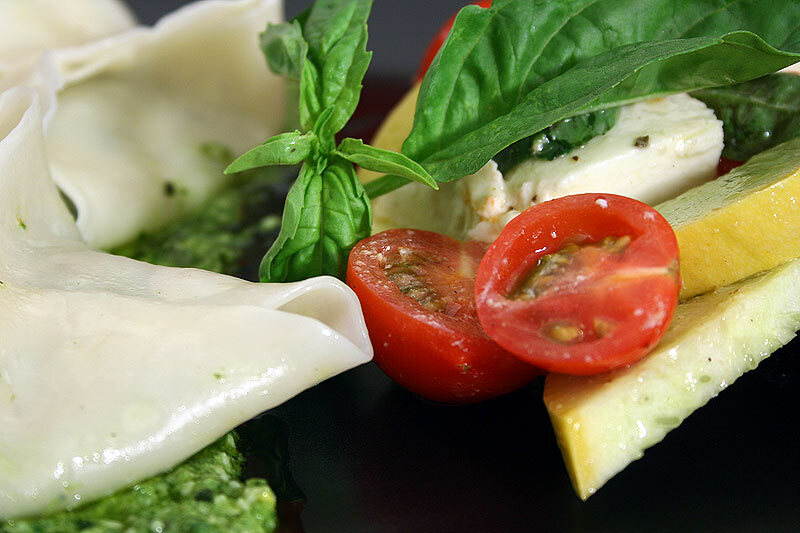 The ravioli was accompanied by a pseudo salad caprese – my take on the traditional salad caprese made with tomatoes, basil, yellow squash, buffalo mozzarella, and a drizzle of white balsamic vinegar and good spanish olive oil. Pseudo Salad CapreseT: we’re back, baby! good ole homecooking, Amanda style! A: On the real-ah! woo hoo! it feels good not to be eating any more orange foods… and by orange foods i’m not talking about fruits! I’m talking about oily, greasy, yummy-but-oh-so-bad-for-you foods. T: yeah, oh my god. we’ve eaten some orange. Hell, any guesses as to what I had for lunch today?… pause for effect… orange tamales! again, orange in color… not to be confused with the fruit. A: for a moment there my mind tried to zero in on how an orange flavored tamale would taste… you know, a traditional tamale with masa stuffed with orange… i just had to shrug that thought off. it’s a no go for me. but dinner tonight was a definate go. i enjoyed this one. A: indeed! this was really my retaliation on greasy, unhealthy foods. i wanted everything tonight to be fresh…and it was indeed. T: it was very fresh. light, fresh veggies. very fresh-tasting noodles. Fresh cheese. basil. I remember thinking, as we ate in the afternoon sun (ok, the afternoon sun was outside, and we were inside, but you get the idea) that it felt like a summer meal. And, it pretty much is summer as far as I’m concerned! A: here here! let it be announced… it is now officially summer (to amanda and tyler)! some people may think that summer is still over a month away, but seriously, who relies on those silly solstices and equinoxes you know? here in san diego, it’s summer once everything turns gray and warm! A: and i’m asleep all day, until i wake up to make dinner/breakfast then go to work, so we don’t really need the sun, right??? AGH!!! we do! i need sun, i think i’m really starting to have a vitamin D deficiency, man. T: you got to supplement, woman! are you drinking your milk? are you going to your local tanning salon? A: 😛 oh haelll no, i’m not going to the damned tanning salon! didn’t we just go over how orange things are bad for you? i don’t need to be one of those orange things. but i guess i should start taking a supplement. T: how bout the milk thing? T: 6oz… that doesn’t sound like enough for a woman without sunlight. heck, you could use the calcium too. A: i know, i don’t want to wind up like my mom, and shrink several inches due to bone loss. T: yeah, no bone loss for you. A: alright, it’s a new goal, get enough calcium now while i’m young. Dinner provided me with a little calcium… there was calcium in both the buffalo mozzarella and the herbed goat cheese. T: true dat. oooh, that buffalo mozzarella was good. i didn’t know such a thing existed! A: yup, it’s well-known to be the best kind of mozzarella. it was my first time using it in a dish. i just love the texture and flavor of fresh cheese. T: ohh it was excellent cheese! very light and soft. Kinda like the consistency of tofu. T: … and I give it a 4.75/5. Every ingredient was excellent, and complimented the others wonderfully. The whole meal jived together. Each individual ingredient became part of something greater! And it all tasted fresh and… just damn good. A: i know we’ve said this before, but i really think we need to have a bad meal soon so we can have more than just high ratings. It really makes us seem like paula abdul on American Idol when all we say are good things! and nobody wants to be a paula! T: That’s true, but… paula would give everything a 4.95/5. We’ve still never had a 4.95/5. That would be quite a meal! A: i know, i don’t really know if i think a 4.95/5 exists for me. it’s just too damn close to perfection, and imho, everything can be made better! T: one day we will have a 4.95/5. one day. and we will know it when it comes. and we will feel warm and tingly. Combine first 4 ingredients then drizzle on the balsamic and olive oil, sprinkle with salt and pepper. Toss and taste. Season some more with salt and pepper if necessary. Serve chilled. Combine first 6 ingredients in a blend/food processor/deep cup with a hand blender and begin to blend. While blending slowly drizzle in olive oil until the mixture is smooth and sauce-like, with out oil collecting on the top. Add a hand full of fresh parmesan cheese. Taste then season with salt and pepper to taste. Great on nearly anything! I’m a fan of pesto, first tried it on pizza with chicken then I bought the jar and ate it with just about anything. one question though, did you both eat only two raviolis each or were there more in the back? 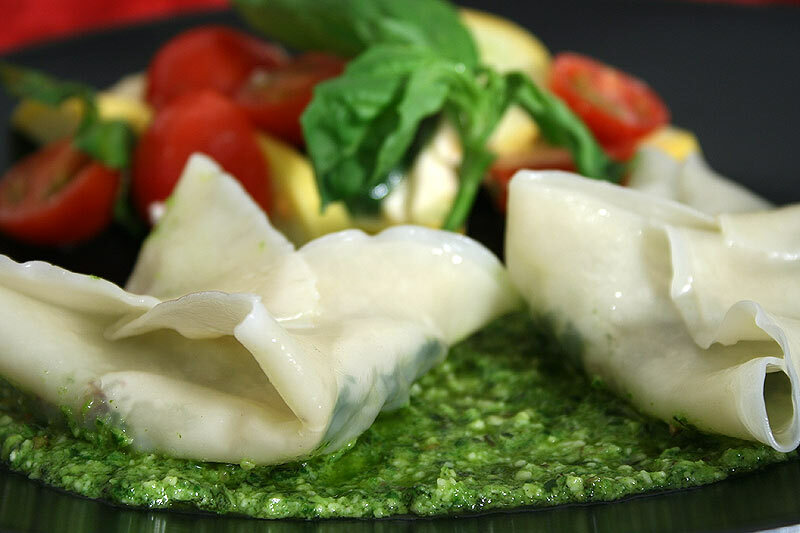 Ron: Seriously, i think pesto is good on absolutely anything savory. and btw, there were more ravioli in the back The plating just looked prettier with only two! Our normal dining process takes forever due to the blogging process but we enjoy it (usually!). I’m in Korea on vacation, will be going back soon enough, trying to get Korea documented well with the time I’ve got. Yeah, that’s another thing I was wondering about when blogging about food cooking at home. So I have to wash my hands after I cut up the vegetables, then take a picture, dry my hands to take pictures in the middle of the process, repeat over and over, I think I’ll have the dryest hands on earth! Will have to tackle that problem though.